Concentrating on core information needed by students, this text integrates basic structure and functions of the eye with clinical ophthalmology. It provides a consistent approach to individual diseases, and has been revised to include current views on ophthalmic disease and treatments. Beautifully illustrated throughout, this new edition of Lecture Notes on Ophthalmology concentrates on the most common eye problems that medical students and doctors are expected to diagnose and manage. The book begins with a brief introduction to the structure and function of the eye and then focuses on core conditions in ophthalmology. The highly structured text is designed to facilitate easy access to information, making the book an ideal resource for revision. New additions include the introduction of a chapter on presenting complaints in the form of clinical cases and an increased emphasis on learning objectives. The book is also thoroughly updated to include material on recent advances in the treatment of diseases such as glaucoma and macular degeneration. 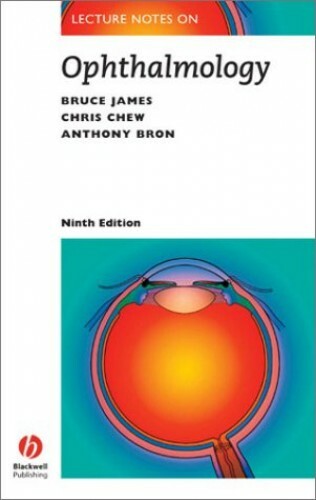 Focuses on the core information needed by students and junior doctors Integrates the basic structure and function of the eye with clinical ophthalmology Consistent approach to individual diseases makes it ideal for quick reference Extensively revised to include current views on ophthalmic disease and treatment New learning objectives at the start of each chapter and clinical cases to aid revision and self assessment The result is a book that remains the most compact yet comprehensive guide to ophthalmology. It will appeal to medical students, junior doctors on foundation programmes, optometry students, practising opticians, general practitioners, and ophthalmic nurses who want a concise introduction to the subject or an ideal revision companion.